Apart from the fascinating anthropological and performance related text concerning masks (excerpted below), the book is full accounts of classroom exercises and experiments with the use of masks for actor training discovered by Sears during his long tenure as Professor of Theatre at Macalester College, in St. Paul, Minnesota, and is an excellent guide for those pursuing such work. "The mask is among the oldest items in our present culture. As far back as the Upper Paleolithic Era, perhaps 50,000 years ago- its use was already known." "It is a fact that all mankind wears or has worn a mask. This enigmatic accessory, with no obvious utility, is commoner than the lever, the bow, the harpoon or the plough. Whole peoples have been ignorant of the most ordinary of tools. They knew the mask. Complete civilizations, some of them most remarkable, have prospered without having conceived the idea of the wheel, or, what is worse, without using it even though it was known to them. But they were familiar with the mask. .... There is no tool, no invention, no belief, custom or institution which unites man so much as does the habit of wearing a mask." Roger Callois: The Mask of Medusa. The mask seems to be ... "the object of a veritable instinct of the human race." Gaston Bachelard: The Mask , in: The Right to Dream. "The effect of framing, is to allow or permit the participants to step into the other reality of the frame. This requires a willingness to step out of the ordinary-to be dispatched, displaced." "The wearer of the mask reflects the terror or delight, the wonder or awe or panic in the eyes of those who were, until a few moments ago, his neighbors-perhaps his wife and children. His audience, responding not to him but to the mask he wears, gives him new clues, and he in turn becomes in feeling temporarily transformed into the creature whose image has been fashioned of wood, or straw, of bark cloth or leather." Margerat Mead; Masks and Men, Natural History 55, 1946. "Imbued with life by its wearer, the mask brings the god on earth, it establishes his reality, mingles him with the society of men; inversely, by masking himself, man testifies to his own social existence, manifests it, classifies it with the aid of symbols. The mask is both the man and something other than the man: it is the mediator par excellence between society, on the one hand, and Nature, usually merged with the Supernatural, on the other." Claude Levi-Strauss: The Many Faces of Man, World Theatre 10, 1961. "Throughout anthropological literature, masks appear in conjunction with categorical change. They occur in connection with rites of passage and curative ceremonies such as exorcisms.... their predominance during transitional periods attests to their appropriateness in the context of formal change. The special efficacy of masks in transformation results, perhaps, not only from their ability to address the ambiguities of point of view, but also from the capacity to elaborate what is paradoxical about appearances and perceptions in the context of a changing viewpoint. Masks, that is, testify to an awareness of the ambiguities of appearance and to tendency toward paradox characteristic of transitional states. They provide a medium for exploring formal boundaries and a means of investigating the problems that appearances pose in the experience of change." A.David Napier: Masks, Transformation and Paradox. The "principle function" of the mask "is to transform and thereby unite, or, perhaps more fundamentally, to unite and thereby transform"
Carl Kerenyi: Mask and Man. "Man's need to extend and transform himself, must be seen as the prime motivation behind the invention of the mask and its well nigh universal use in magical and religious ceremonies." Muensterberger: Man's Need to Change. "What needs transformation? one's body? One's role? One's status? One's relationship to someone or something else? All of these kinds of changes are subsumed in changing what is perhaps the most important semiotic signifier of all- one's face. But why the face? What is there about the human face that predestines it to be the primary locale for the placement of the covering mas, the substitute face?" Sears A.Eldredge: Mask Improvisation, The Compelling Image. The face has primacy over the rest of the body because"..four of the five senses are concentrated in the face - seeing, hearing, smelling, and tasting - which makes the head the region par excellence of emotional expression. The face can be considered as the mirror of the two poles of the inner life: primary emotion and lucid intelligence." Charlotte Wolff: The Psychology of Gesture. However we need to be careful about overemphasizing the face alone. "The mask must .... be considered from a larger perspective, so as to include the costume, the headdress, the possible accessories, as well as immaterial factors such as the behavior, the dance steps, and the songs or text pertaining to the mask." Henry Pernet: Masks: Theoretical Perspectives. For the training of the actor, the knowledge and practice of performing masked seems to be indispensable. In depriving the apprentice actor of the use of his face, the mask requires him to perform with his entire body; to do away with making faces; to get outside of himself; to deeply, physically and psychologically, understand the value of a position, a gesture, of a step; to develop within himself the pure dramatic instinct; the sense of play, of character, of situation; to depart from photography in order to raise himself to the level of sculpture; to understand that art interprets nature but does not copy her. The Brilliant French critic, director and teacher Jaques Copeau first employed mask improvisation training for the actor as an important and necessary procedure for his young students at Ecole du Vieux Colombier in Pairs between 1920 and 1924. He discovered in the mask a compelling image for releasing the psychophysical being of his students and a potent agent for teaching them how to transform into their characters. Copeau was not interested in teaching actors to impose their own psychological needs and physical idiosyncracies onto every role they were to play, turning their performance into another presentation of themselves. He wanted instead, to develop actors who would be willing to cultivate their imaginations, their minds, bodies and emotions, to receive the psychophysical needs of their characters. It is from Copeau and his students, particularly Michel Saint-Denis (Copeau's nephew) and Jaques Le Coq (a student of Copeau's son-in-law, Jean Daste), that all modern mask improvisation training has descended. Mask improvisation is an actor training method that sensitizes and frees the imagination stored in the psychophysical being of the performer. Sears A. Eldredge, "Mask Improvisation"
Has a double purpose: the first is to train actors to be more effective in their acting without masks. This was Copeau's original intention, and is still the primary purpose of mask improvisation training in schools of theatre. The second purpose is to provide those performers interested in alternative performance styles, such as nonrealistic acting, solo performance of multiple roles, or mask theatre, with a foundational method for their experiments. 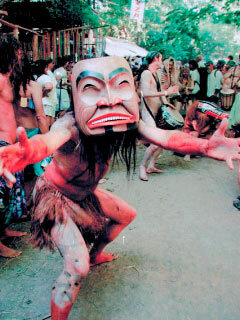 Indeed, performers in mask theatre must have prior training and experience in mask improvisation. The importance of the Neutral Mask in the training of actors is crucial. ....a fully sculpted Neutral Mask is the most effective. A Neutral Mask needs to have some "presence" (weight) and a slight flexibility so it will mild itself to the wearer's face. Leather masks, of course, would be the best, but are difficult to come by and very expensive. "Whoever, having a mask in his hands, and the ambition to play with it, isn't seized by an emotion which suddenly detaches him from his own humanity and plunges him into a "state" which he cannot define but where he suddenly enters into a sort of quasi magical, mysterious, fever; whoever, having hidden his face behind a mask of a given character, doesn't feel himself immediately possessed by an irresistible force, burlesque or tragic, from head to foot, that one will perhaps be able to interpret "the roles" agreeably; he is assuredly not and never will be a true dramatic "creator." "The masks make terrible demands....The mask is not makeup. It is not a nonentity. Everything is at its service. If you use it wrong it will denounce you right away. You are the one to yield to the mask, it will never yield. So you have to respect it, love it. If not, it is as though you don't recognize that these masks have a history, a past, a divinity. Instead of wishing to rise toward them, you bring the mask downward to you, you make them banal. You have to make a journey toward them. You do not use a mask in any which way. You do not use just any mask, either. Our relationship to the mask is one of magnanimity." Making Neutral masks has been the most challenging task in my career as a mask maker. The concept of neutral is itself a source of contention and it may be that nothing is truly neutral. I have based my leather neutral masks on those made by Amleto Sartori for Jaques LeCoq. I was fortunate to have been able to see the Matrices, that were made for LeCoq's masks, when I studied with Donato Sartori, Amleto's son, at his Abano Terme, Padova studio in 1995. The neutral mask should be symmetrical and have as little expression of emotion as is possible and thus be available to reveal all expressions. The mouth is not designed for speaking (although I do now make the leather neutrals with an opening at the mouth, to facilitate comfortable breathing). Neutral mask work is indeed about focussing on the physical and is done in silence to that end. The neutral masks of Amleto Sartori are androgynous and Euro-centric. These are two traits which seemed to me to be unnecessary for their task. The first because since neutral work is done with form fitting black unitard or leotard, the gender of the actor is, for the most part, obvious, and of no consequence to the work at hand. The second, and perhaps most contentious quality of the elder Sartori Neutrals, is that of their inherent Euro-centricity. As actor training must accommodate people of all ethnicities, the availability of only caucasian models presents a problem. I have added "Afro' and Asian" Neutral masks to my collection to address this. "The importance of the Neutral Mask in the training of actors is crucial. ... A Neutral Mask needs to have some "presence"(weight) and a slight flexibility so it will mold itself to the wearer's face..a fully sculpted Neutral Mask is the most effective... Leather masks, of course, would be the best.. ....using a (neutral) mask helps both the participant and the observers concentrate on the body and the body's movement. From the observer's point of view, the fact that the mask obscures the student's face seems suddenly and sharply to etch the silhouette of his body in space. As observers, we actually watch for the whole body of the actor to communicate. What the actor now learns is that when he is onstage, at a distance of twice his height from an audience, his face is not the primary communicator of what's going on. At that distance, the audience can no longer "read" the actor's face clearly, even though they believe they can. The audience actually reads the signals sent by the actor's body and transfers them to his face. That is why in the performance the physical and the verbal must send the same messages..... The mask reveals as it conceals. From the participant's point of view, the mask promotes the participant's concentration so that he has an enhanced awareness of his whole body moving through space. It also gives him a sense of protection.... helping to hide any embarrassment he might feel in having his body and his movement openly commented on.... The mask conceals as it reveals." Sears Eldredge. Mask Improvisation for Actor Training and Performance... The Compelling Image. "The moment you take someones face away (in this case with the neutral mask), it's the most electrifying impression: suddenly to find oneself knowing that the thing one lives with, and which one knows is transmitting something all the time, is no longer there. It's the most extraordinary sense of liberation. It is one of the great exercises that whoever does for the first time counts as a great moment: to suddenly find oneself immediately for a time liberated from one's own subjectivity." .... Peter Brook, Lie and Glorious Adjective. 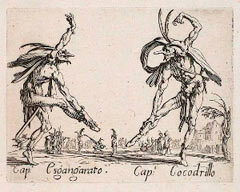 During the Renaissance in sixteenth century Italy, a form of masked theatre developed from indigenous folk and classical roots. This was the Commedia Dell'Arte, the "Theatre of the Professional Artists," as compared with that of amateur performers in the Universities and Royal Courts. The hallmark of this new theatre was the use of masks for some characters, the presence of women performers in the troupes, and the actors' abilities to improvise dialogue and business within the confines of a set scenario. One characteristic of the Commedia Dell'Arte that allowed this freedom to improvise was that all the roles were based on stock types, the masked characters of Pantalone, Il Dottore, Arlecchino, Brighella, Pulcinella and Capitano being the most representative. The Italian word maschera (mask) refers not only to those characters actually masked but also to a fixed role, personality, vocal quality, movement and behaviour established for each of the characters.